I gave it a try with `sudo add-apt-repository ppa:jpeddicord`. Not only did it add an entry to sources.list.d, it also fetched the GPG key automatically. Out of curiosity, I opened software-properties-gtk (system > admin > software sources) and tried to add a PPA on the third-party software tab. Using the same syntax for the add-apt-repository command, it worked. Didn't appear to grab the GPG key at first, but after restarting the interface the key was indeed there.This is awesome, and definitely lowers the barrier for adding PPAs to a system. Great! 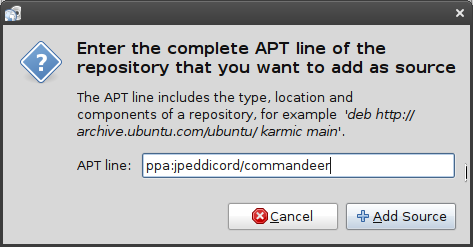 Another cool feature would be if we could add a href on a repository page which was mapped to add-apt-repository, so that you click on a link like ‘apt-repo://ppa:jpeddicord/commandeer’, and the system would ask for confirmation that you really want to add this repo to your apt list, then add it. this is sweet. Just one more reason I am happy that ubuntu has new releases every 6 months. « Ubuntu 9.10 (Karmic Koala) Beta released!